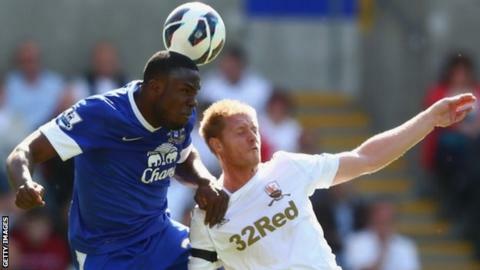 Long-serving Swansea City defender Alan Tate said his side's performance in Saturday's 3-0 home defeat by Everton lacked fight and team spirit. "It was probably one of the worst team performances we've had for a long time," said Tate. "We need to get back to being a team otherwise we've got no chance. We had too many people playing as individuals. Out there it was 11 individuals. "To beat a team like Everton you need to be a team." Swansea looked lethargic from the first whistle, and needed three saves from Michel Vorm in the opening three minutes to deny a dominant Everton. Victor Anichebe finally made the visitors' pressure tell with the opener, before Kevin Mirallas doubled the lead on the stroke of half-time. Swansea's hopes of a rival evaporated when Nathan Dyer was sent off for two yellow cards in a minute after replacing home debutant Pablo Hernandez. Everton pressed on and Marouane Fellaini's header gave the final scoreline a truer reflection of Everton's dominance. Tate, who first joined Swansea in 2002 and has climbed with them from the bottom division to the top flight, said the home side failed to show any appetite for hard work. "You need to do the dirty jobs off the ball that go unnoticed - tracking midfield runners, tracking full-backs and being physical," said the 30-year-old. "If we don't do that, we're not going to beat teams like Everton. We were more interested in attacking than defending, which you can't do. You've got to do both." Swansea manager Michael Laudrup felt Dyer was "a little unlucky" to be given a second yellow card for his challenge on Leighton Baines, but felt his side deserved nothing from the game. "In the first 10 minutes I think we gave away six free-kicks," said Laudrup, describing Everton as the best team he has faced this season. "Playing against Fellaini and Anichebe, it's like asking for problems. We then came back into the game but you can't give away 30 minutes at this level and we were 2-0 down. "It's true we came back and created some chances but you have to score otherwise it doesn't count." The defeat follows a 2-0 loss at Aston Villa. A trip to Stoke City awaits after Tuesday's Capital One Cup tie and Laudrup warned his players must be smarter to deal with the physical challenge.